On 17th of December 2018 Ukrainian Railway start operation of new Uzhgorod - Dnipro - Zaporizhia Train connecting West and East of Ukraine - the impetus for development of Ukrainian tourism. 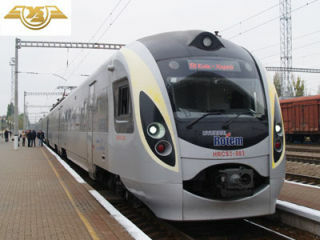 The new train will provide passenger connection of Transcarpathia with cities Dnipro and Zaporizhia and operate on odd days during all year around. Night Express Uzhgorod - Dnipro - Zaporizhia departure from Uzhgorod at 13:20 and arrive the next day in Dnipro at 08:13 and in Zaporizhia at 10:14. On the way back the train departe from Zaporizhia at 14:40, from Dnipro at 16:40 and arrive in Uzhgorod next day at 11:06. Uzhgorod - Dnipro - Zaporizhia Train runs with stops at stations of Mukachevo, Volovets, Lviv, Bila Tserkva and others. The new train ride from Uzhgorod to Zaporizhia takes around 21 hours and lets look at Carpathian Mountains in all beauty during day time. One way train tickets Uzhgorod - Dnipro cost 992 UAH (around 32 Euro) and Uzhgorod - Zaporizhia - 1050 UAH (around 33 Euro).